Israeli soldiers invaded, on Wednesday at dawn, the al-Am’ari refugee camp, near the central West Bank city of Ramallah, shot and killed a young Palestinian man, and wounded several others. Medical sources said resident Issa Salem al-Qatari, 22 years of age, was shot by several live rounds to the chest, and died of his wounds at the Ramallah Governmental Hospital in Ramallah. Eyewitnesses said dozens of soldiers, and undercover forces, invaded the refugee camp, and kidnapped a Palestinian, identified as ‘Ala Jalayta (ar-Reehawi), from his home. The army also invaded and searched several homes in the camp. Following the invasion and arrest, clashes took place in the camp after a number of local youths hurled stones at the invading soldiers, while the army fired dozens of rounds of live ammunition in the alleys and homes of the camp, killing al-Qatari, and wounding several others. The Maan News Agency said al-Qatari was preparing for his wedding that was planned for next week. 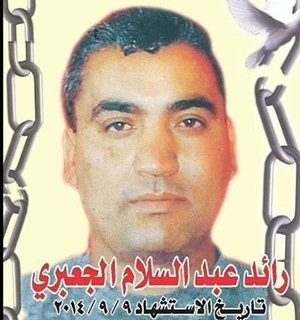 35-year-old prisoner Ra'ed Al-Jabari, from Al-Khalil city, was proclaimed dead on Tuesday in an Israeli jail. 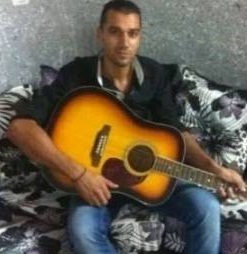 The Palestinian prisoner society said that Jabari died in Eshel jail under mysterious circumstances and held his jailers fully responsible for his death. Abdul-Salam al-Jabari, the prisoner's father, accused Israel of killing his son and demanded an immediate investigation. The father said that Ra'ed spoke to his wife and children on Sunday and was in a good physical condition. 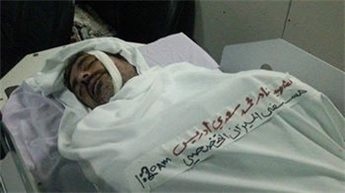 The Israeli prison authority claimed that the prisoner committed suicide, but the Palestinian prisoner society belied the Israeli allegation and called for international probe into the cause of his death. In a separate incident, more than 40 Palestinian families of prisoners in al-Khalil on Monday handed the Red Cross a protest petition against Israel's confiscation of their prison visit permits. The petition was submitted during a sit-in organized by the families outside the Red Cross headquarters in the city. The families appealed to the Red Cross to seriously move to enable them to see their sons regularly in Israeli jails and pressure the Israeli side to end its arbitrary measures against all relatives of prisoners. Israeli intelligence officers at Addahirya and Tarqoumiya checkpoints last week prevented over 40 Palestinian families from al-Khalil from visiting their relatives and sons in Ramon jail and confiscated their visit permits. Medical sources in occupied Jerusalem have reported that dozens of residents have been injured, on Monday evening, after Israeli soldiers and police officers attacked the funeral procession of a Palestinian teen who died of a serious injury suffered, after being shot by the soldiers, last week. 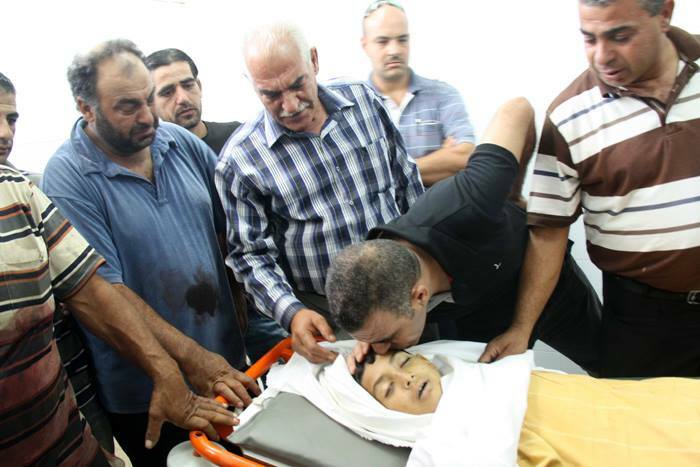 The slain Palestinian has been identified as Mohammad Sonnoqrot, 16 years of age. Media sources in occupied Jerusalem said the family and hundreds of Palestinians conducted the funeral prayers at al-Aqsa mosque, before marching towards a graveyard for burial ceremonies. However, the police and the army attacked the procession, firing gas bombs and rounds of live ammunition, causing dozens of injuries among the Palestinians. The soldiers also invaded the local graveyard and kidnapped at least ten Palestinians, including a number of children. Some of the kidnapped have been identified as Zaki al-Mahlous, Shaker Nasreddeen, Anis ‘Ayesh and Nidal Sonnoqrot. The Israeli attacks caused widespread protests and clashes in the area, and in Salah Ed-Deen Street, and several other areas in occupied Jerusalem. It is worth mentioning that the Israeli Police handed over the family the body of their son on Monday evening, despite promises to release his body earlier. He was instantly transported to Al-Maqasid Hospital in Jerusalem, before being moved to his family home in Wad al-Jouz. 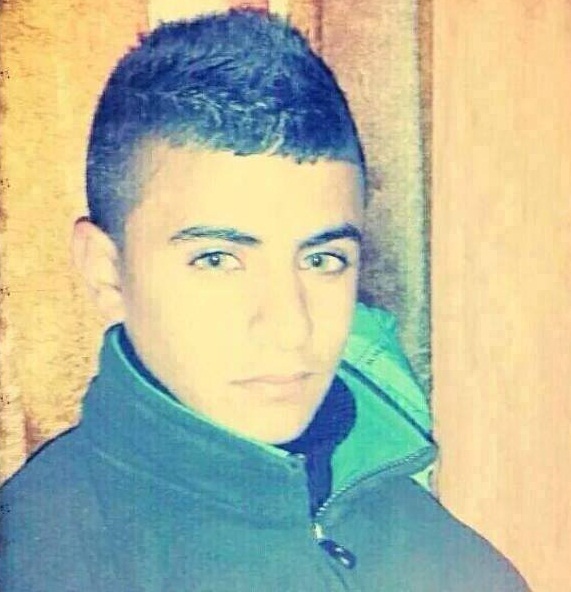 Mohammad suffered a serious injury after being shot by Israeli soldiers in Jerusalem last week. His father said that the doctors at the Hadassah Israeli Hospital said Mohammad was shot in the head by a rubber-coated metal bullet, and was moved to the Intensive Care Unit before being declared clinically dead two days ago. On Sunday, Sonnoqrot succumbed to his injuries. The family said it would be filing a lawsuit against the police for shooting their son and causing his death. Meanwhile, Israeli police spokesperson Luba Samri said the current information they have is that “there were clashes, and that the police used crowd dispersal means,and alleged that the police “did not use rubber-coated metal bullets." She claimed that the Palestinian teenager was shot by a “sponge-coated” round in his leg, and apparently fell onto the ground while running away," causing a serious injury to the head. Samri refrained from providing further details due to what she called "legal issues,” and said only that the case had been moved to the complaints department of the police in Jerusalem. 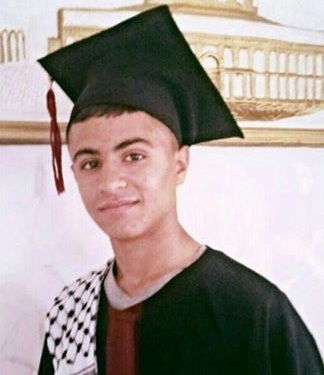 Abd al-Majid Sunuqrut told Ma'an that his son Muhammad Abd Al-Majid Sunuqrut, 16, "died as a martyr this morning and his body is expected to be taken to the Abu Kabir Forensic Institute for an autopsy to be undertaken by a Palestinian doctor and a lawyer." Muhammad was shot on Monday by Israeli forces in the head as he was talking on the phone in Wadi al-Joz in what his father at the time told Ma'an was an "unprovoked attack." Although Palestinians in occupied East Jerusalem live within territory Israel has unilaterally annexed, they lack citizenship rights and are instead classified only as "residents" whose permits can be revoked. Such Palestinian passivity encouraged Israel to persist in the killing of the Palestinians and to wage another genocidal war on the population in Gaza, he added. A Palestinian young man was killed and another injured in an Israeli occupation forces’ shooting at a car at a military roadblock near Qalqilia on Tuesday evening. Media sources identified the young man as Mohammed Sabri from Kufr Qalil village, south of Nablus, and the injured youth as Othman Omar. The IOF command claimed that the young man bypassed a military roadblock and tried to run over soldiers. Palestinian security sources, however, quoted eyewitnesses as saying that IOF soldiers opened fire at a Palestinian car carrying workers as soon as it reached the checkpoint. Palestinian medical sources in the West Bank have reported that a Palestinian child died, Monday, of a serious injury suffered after the army opened fire at Palestinians near the northern West Bank city of Nablus, last Friday. The sources said Hassan ‘Ashour, age 15, was shot by several rounds of live ammunition in the chest and liver, and was later declared clinically dead until he passed away on Monday morning. Local sources said that the child was wounded during clashes which took place at the Beit Forik Israeli military roadblock, east Nablus, after the soldiers assaulted several Palestinians. In related news, dozens of soldiers invaded the Deheishe refugee camp, south of the West Bank city of Bethlehem, and kidnapped one Palestinian. Local sources said the kidnapped Palestinian has been identified as Ra’fat Na’im Abd Aker, 46 years of age. Also, a Palestinian from Nahhalin village, west of Bethlehem, was kidnapped in occupied Jerusalem for "not holding an entry and work permit". 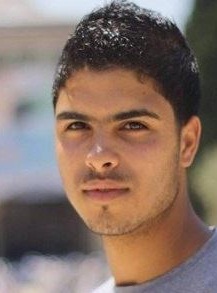 The Palestinian has been identified as Nassar 'Aqel Najajra, 21. At least 111 Palestinian children were killed during the first half of August due to Israeli carnages stepped up against the besieged Gaza Strip since July 7, official Palestinian human rights data revealed. Such a rate brings the total number of Palestinian children killed since the launch of the military offensive to 534 children, including 479 below the age of 18. Department of Child Affairs in the Palestinian Information Ministry said the Israeli occupation troops nabbed dozens of Palestinian minors from different areas while hundreds of others were wounded in a series of attacks carried out by the occupation forces and extremist settler gangs. About 230 Palestinian children are currently locked up in Israeli jails, the same sources added. 35 Palestinian children in the West Bank sustained wounds after they were shot by the Israeli occupation forces during raids and attacks on Palestinian peaceful pro-Gaza marchers. A number of children were left wounded as Israeli settlers deliberately ran over them. In al-Khalil, 21 Palestinian children sustained wounds due to heavy gunfire by the invading IOF patrols against Palestinian citizens who partook in non-violent anti-Israel rallies. A second autopsy report asserted that the Israelis harvested some organs from the body of slain Jordanian citizen Wael Allan, who was recently tortured to death by police interrogators in Tel Aviv. According to the report, Jordanian dissectors found out that the tongue, throat and some cardiac tissues were removed from the body of Allan. 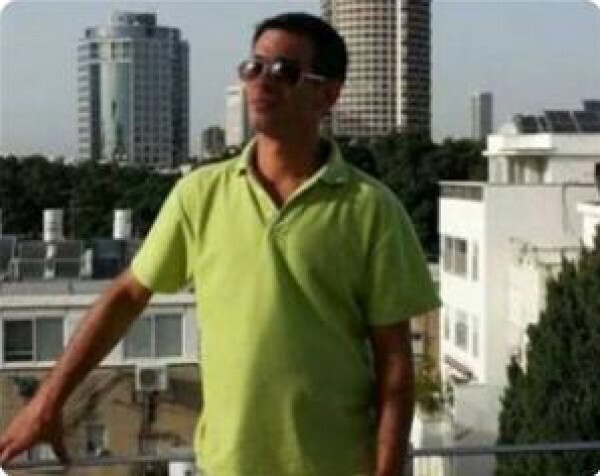 Wael Allan was reportedly detained on allegations of his illegal stay in Israel. 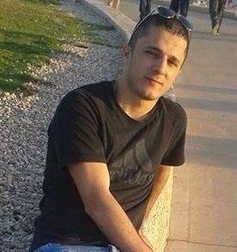 Palestinian medical sources have reported, on Thursday morning, that a young Palestinian man was killed after being rammed by a settler’s vehicle near an illegal Israeli settlement, in the central West Bank district of Salfit. The sources said the Mohammad Abdul-Karim Abu Eslayyim, 23, from Hares village, near Salfit, was struck by the settler’s vehicle as he was trying to cross the road, close to the Borkan illegal settlement. Israeli police officers and an Israeli ambulance arrived at the scene, but the Palestinian had been already dead; a Palestinian ambulance moved the slain Palestinian to the Salfit governmental hospital. The Palestinian police said it is investigating the issue, in an attempt to determine whether the incident was a deliberate attack. Unlike dozens of similar incidents that led to deaths and injuries of scores of Palestinians, including children and elderly in different parts of the occupied West Bank, the settler actually did not flee the scene. On Thursday, August 7, a Palestinian child was seriously injured after being rammed by an Israeli settler’s vehicle, in the Old City of Hebron, in the southern part of the West Bank. On Wednesday, March 26, a 55-year-old woman was moderately injured, after being hit by a settler’s car in Teqoua’ village, east of the West Bank city of Bethlehem. A Palestinian was killed an another injured after explosive ordnance leftover from the Israeli army exploded near Tammun village near Tubas, witnesses said Monday. 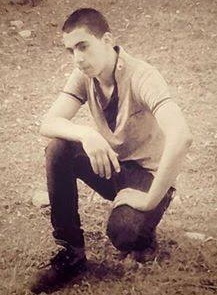 Muhammed Mutasim Abu Shtayyeh, 17, was killed and his brother Yusif was injured in the blast which happened when they were grazing sheep. The body was taken to Tubas hospital and PA police opened an investigation. The area where the explosion occurred is used frequently by the Israeli army for military drills, locals said. Palestinian medical sources reported that a young Palestinian man was killed on Monday, at dawn, by an Israeli “Energa” shell fired on a home in Qabalan village, south of the northern West Bank city of Nablus. Several Palestinians have been injured. 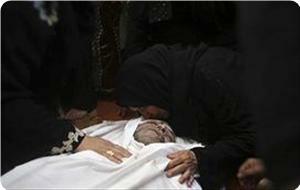 The sources said the slain Palestinian has been identified as Zakariyya al-Aqra’, 24. Head of the Qabalan local council, Hisham al-Az’ar, said the army surrounded a home in the town, and fired several “Energa” shells into it, killing the young man, and wounding at least eight others, including women and children. The soldiers also kidnapped the al-Aqra’s brother, Bilal, and another young man, identified as ‘Ala Hasan Abdul-Rahim. Al-Az’ar stated that dozens of soldiers invaded the area, surrounded the home of resident Sohaib al-‘Emla, and demolished part of it before firing the shells into it. The Radio Bethlehem 2000 said that dozens of soldiers, armored vehicles and two military bulldozers, invaded the area, and demolished part of the home. It added that at least eight Palestinians, including five family members, have been injured by Israeli army fire and shells. Two undercover Israeli soldiers have been mildly injured during a fire exchange with al-Aqra', Israeli sources said. 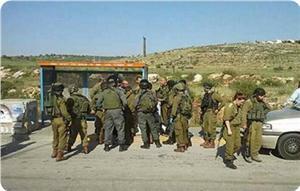 The army claims the armed clash with the Palestinian lasted for a few hours. Israel alleges al-Aqra’ shot and seriously injured an Israeli soldier around two weeks ago, as the army was preparing to invade Qabalan. Since then, the army has been conducting daily invasions and attacks in the town. 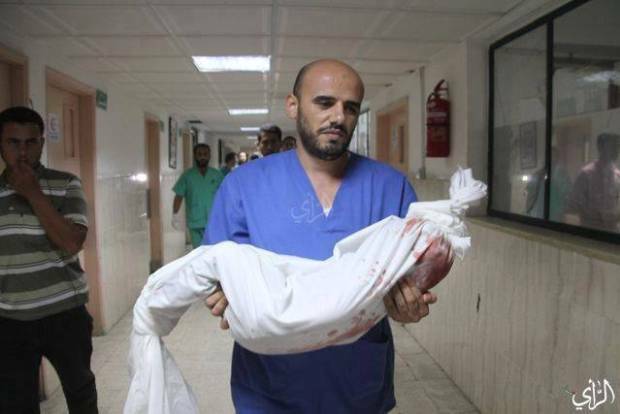 Also on Monday, the Ministry of Health in Gaza, said a Palestinian infant, 45 days of age, died of recent serious injuries suffered after the army bombarded her family home, in Central Gaza. She has been identified as Maida’ Mohammad Aslan, 45 days of age. 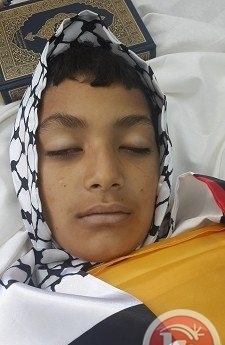 A 12-year old Palestinian boy was shot dead by Israeli soldiers while playing in front of his home in al-Fawwar refugee camp south of Hebron in the southern West Bank early Sunday, medics told Ma'an. They said that the gunshot entered through the victim's lower abdomen and exited through his groin. Locals told Ma'an that shortly before the boy was killed an Israeli military force escorted Israeli engineers into a neighborhood known as Nabat al-Haffara for unknown reasons. "We don't know what they (the Israelis) were doing," Yussef al-Anati told AFP, crying, his shirt soaked in blood after carrying his nephew to hospital. "Khalil was playing in front of the house, then we heard gunfire. The kid was screaming and fell down," he said. "He was shot in the back and the bullet exited through his stomach." AFP gave a conflicting report of his age, quoting medics as saying he was 11. Palestinian medical sources in Hebron, in the southern part of the occupied West Bank, have reported that a young Palestinian man died Saturday, at dawn, of a serious injury suffered Friday, after Israeli soldiers opened fire at local protesters in the city. 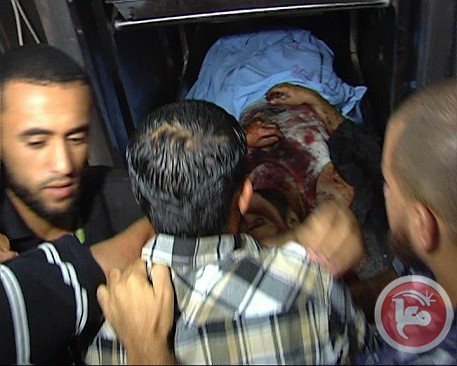 The slain Palestinian, Nader Mohammad Edrees, 40, was shot by a live round to the heart. The sources said the soldiers fired rounds of live ammunition, gas bombs and concussion grenades at scores of protesters in the Bab az-Zaweya area, in the center of the city, causing dozens of injuries, including 25 shot and injured by rounds of live ammunition. Doctors at the al-Mezan Medical Center in Hebron, performed a heart surgery in an attempt to save the live of Edrees, and administered 40 units of blood, but he succumbed to his serious wounds around 2 after midnight. Prayers and the burial ceremony will be held Saturday, in Hebron. Edrees was shot during a massive nonviolent protest against Israel's aggression against the Palestinians in the Gaza Strip, and it's ongoing violations in the West Bank. At least forty Palestinians were injured in the Israeli military attack, some by live rounds and, the rest, by rubber-coated metal bullets, gas bombs and concussion grenades. On Friday, a young Palestinian man was shot and killed by Israeli army fire near the Psagot illegitimate Israeli settlement, built on Palestinian lands belonging to residents of al-Biereh City, near the central West Bank city of Ramallah.